Hellas Verona have surprised many this season with better-than-expected results. Perhaps the most surprising aspect of their campaign is their lack of goals. With only 6 goals in as many games, they are only behind Milan on goal differential. So if either team can take three points away from Verona on Sunday, it will be the team with the better defense. Or perhaps it will be the team for whose fans this game is more than a religion. There is no love lost between our teams, as Verona fans will be quick to remind Milan how many Scudetti were lost at the Stadio Bentegodi (two, if you are keeping track.) 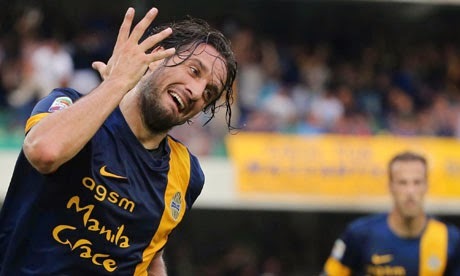 And to add insult to injury, Verona were the first to draw Milan blood last year at that very same stadium, with a brace from numero uno, Luca Toni. Let’s hope Milan’s desire for revenge overcomes all of the other odds, or that we can at least keep up our habit of scoring more goals than we concede. With two teams with the same results, this match could easily be decided by home advantage, which unfortunately goes to Verona. Not only is Verona one of those fortresses, they are a team whose fans would literally bleed for the shirt, even just for three points against a “big” club like Milan. However Milan have a number of returning players to reinforce a squad that has accomplished quite a lot on grinta alone. And our experienced players have quite a lot of experience playing in big matches, too. Verona are coming off of the international break having defeated Cagliari with a singular late goal by Tachtsidis in round six. For this match, Mandorlini lined up Rafael; Marquez, Moras, Marques, Agostini; Ionita, Campanharo, Tachtsidis; Toni, N. Lopez, and Gomez. While Mandorlini looks to have Benussi and Martic available after injury, Christodoulopoulos and Obbadi are unlikely to play. Sala and Campanharo are both unlikely as well, after training injuries earlier this week. But it is Ionita and Tachtsidis who have two goals each, and with Toni’s taste for Milan blood, Mandorlini still has plenty of options to hurt us. Milan are still missing Montolivo, who will be missed at least twice as much this time due to De Jong’s suspension. That’s right, we could see that duo of Essien and Muntari that Inzaghi put out in his 4-2-3-1 in training last week (shudders.) Diego Lopez is still a doubt, despite returning to training this week, as are Saponara and van Ginkel. However Abate, Bonaventura, and Menez look likely to be available, so we are definitely better off than before the break. Well except for missing De Jong. That's gonna hurt. Bad. "Wait, you're telling me I have FOUR assists already?!"